Forget the S&P -- markets in China are on an insane tear this year and show no signs of slowing. 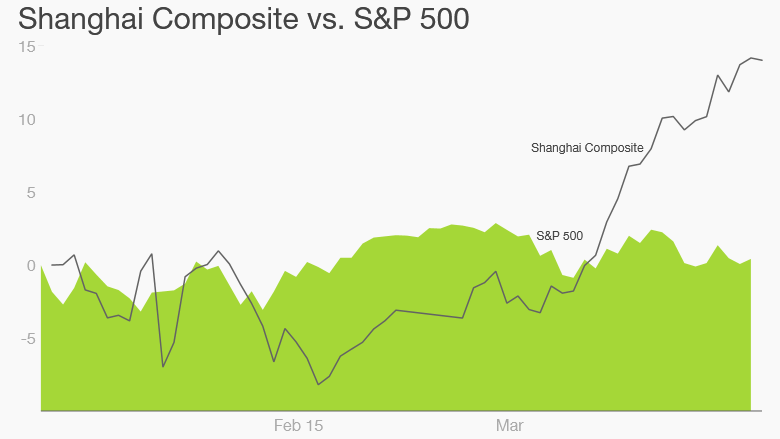 The Shenzhen Composite has surged a whopping 47% so far -- easily making it the world's hottest market in 2015. China's benchmark Shanghai Composite has also jumped a staggering 19%. These giant market leaps are at odds with the broader Chinese economy -- GDP growth is clocking a slower pace and recent economic data points have been disappointing. But experts say that Chinese investors are betting the central government will be forced to take stimulus action to revive the sluggish economy -- a move that is expected to keep lifting stocks. "The equity market clearly believes the Chinese government will continue to take policy action to achieve its growth target, and poor growth statistics will lead to greater policy easing," wrote BNP Paribas equity strategist Manishi Raychaudhuri in a research note. The country's banks have also been told they can keep less cash in reserve, and benchmark interest rates have already been cut twice this year. Both moves have boosted stocks, according to Michael Liang of Foundation Asset Management. Economists predict the central bank will cut interest rates even further. Shenzhen, in particular, has been helped by its mix of listed companies -- the index is full of young tech, media and telecom firms. 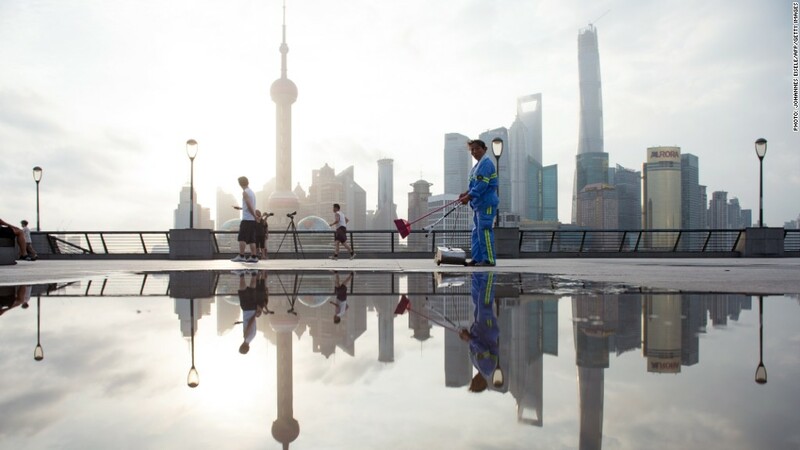 In Shanghai, large state-owned firms are the main attraction. Experts say China's equities boom has also been fueled by renewed interest from retail investors. Back in 2013, investors fled in droves after a series of fat-finger trading errors damaged confidence and raised questions over poor market regulation. Now, many individual investors are taking their money out of alternative investments -- such as the flailing property sector -- and putting it back into stocks. About 170,000 new stock trading accounts are opened per business day in China, more than 10 times the average for last year, according to BNP. China's massive stock rise is only lining the pockets of domestic investors -- foreign investment into Chinese stocks is still largely restricted. Trading volume through a program that launched last year allowing foreigners to invest in Shanghai has contributed a negligible fraction of daily turnover, Raychaudhuri said. But for Chinese investors, "the wall of money seems destined to continue flowing, at least in the near term," said Raychaudhuri.